We've all seen those festive red, white and blue desserts for the Independence Holiday... but why should the colors be limited to mainly desserts? 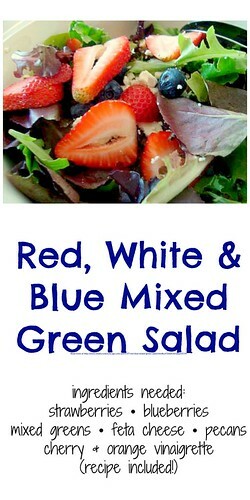 I've taken the colors and brought them into a salad I prepared for dinner. This salad takes sweet strawberries, plump blueberries and mixed greens, all dressed with a cherry & orange champagne vinaigrette. 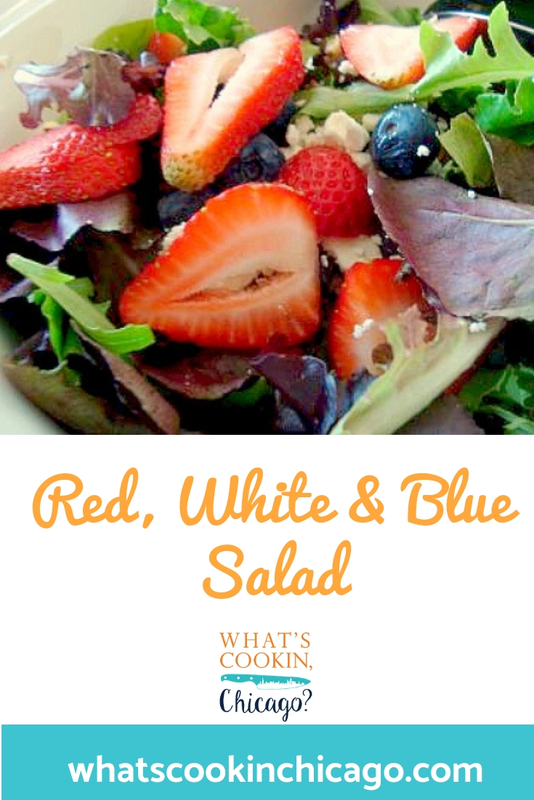 Combine all the ingredients in a salad bowl and serve immediately. What a great, simple yet yummy idea! I made my own Red (beets), White (pears) and blue (bleu cheese) salad for the holiday. It's from Cook's Illustrated--I substituted arugula for watercress (since I've heard conservatives accuse liberals of being "arugula eating"). Serves 4 to 6 . Published November 1, 2000. This salad is great served with warm pears. Roast the pears immediately after the beets and toss them into the salad while still warm. 1. For Beets: Adjust oven rack to lower-middle position; heat oven to 350 degrees. Wrap each beet in foil and roast until fork can be inserted and removed with little resistance, 1 to 11/2 hours; unwrap beets. When cool enough to handle, peel and cut beets lengthwise into quarters; cut each quarter in half into wedges. 2. For Roasted Pears: Place baking sheet or broiler pan bottom on rack, and turn up oven heat to 500 degrees. 3. Peel and halve each pear lengthwise. With paring knife or melon baller, remove core. Set each half cut-side down and slice lengthwise into fifths. 4. Toss pears with butter; add sugar and toss again to combine. Spread pears in single layer on preheated baking sheet, making sure each slice lies flat on surface. Roast until browned on bottom, about 10 minutes. Flip each slice and roast until tender and deep golden brown, about 5 minutes longer. 5. For Salad: Whisk together oil, vinegar, salt, and pepper to taste in small bowl. 6. Combine beets, blue cheese, and watercress in large serving bowl. Add pears and vinaigrette; toss gently to combine. Serve immediately.